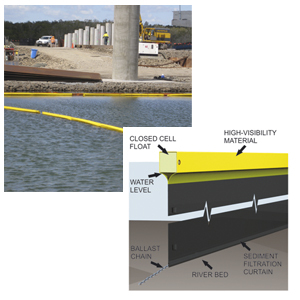 The Curtain contains silt runoff in streams by acting as a floating barrier. The floats are closed cell polyurethane and are encased in a high visibility yellow material. It is made from a non woven geo-textile with a mean aperture of 120 microns. It’s 2m deep and equipped with a ballast pocket at the bottom and heavy duty chain as ballast. Depth of the Curtain can be customised. The Curtain comes in 10m lengths. • River and creek protection where earthworks are in progress. • This is for silt control. For spill containment use instead floating booms. • Limit to low current and low waves.